One of the most valuable tools used by farmers, consultants and researchers is the examination of soil profiles on a particular block of land that is used for the full range of agricultural production. This could range from evaluation of veld types for soil depth and structure, through crop and pasture production, to the planning to establish commercial viable forestation. A profile hole will enable the assessment, evaluation and quantification of the kind and extent of ground cover, soil health and tilth, soil depth, soil type, soil stratification into top, middle and bottom layers. If the land has growing crops on it the root development can be tracked in the soil as well as any layer that might act as an impediment to full root growth such as plough or disc pans, structurally hard layers or impenetrable layers due to the chemical composition or nutritional deficiency of a particular lower layer. Soil profiles should be examined throughout the growing season on each different soil type found in your operation. 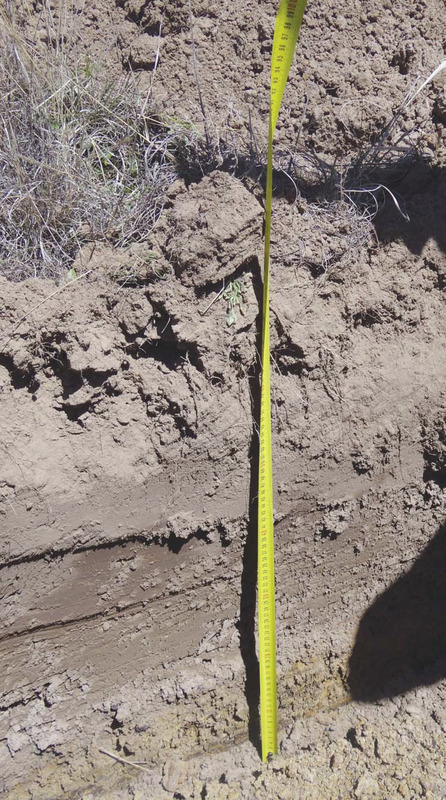 Examining and quantifying a soil profile for the total amount of stored moisture after a winter fallow period can indicate several critical factors. An evaluation can be made of how much early summer rain is required to be able to plant with confidence and whether or not the crop is likely to be able to complete its growth cycle, given the average or normal rainfall patterns experienced on your farm. Profile holes should be at least 1 metre by 1 metre and deep enough to show the whole profile for the deepest effective rooting depth of the crops or pastures to be grown on a particular land. An East/West orientation assists in taking photos during midmorning. The holes can be dug by hand or quickly established by using a mechanical backhoe that is almost a standard piece of equipment on many farms these days. If a few holes are to be examined for an initial evaluation choose what you would consider the best or worst crop production blocks and differing soils that are under pastures. If you have farmed for several years do at least one on a soil within a land that always seems to produce good crops. This may become the benchmark soil profile on your farm. Keep in mind that the deepest soil might not be producing at optimum due to a range of fertility problems including high acidity or low levels of phosphates or other minerals. It is always a good idea to take soil samples when evaluating soil profile holes. The general structure of the soil as well as the fertility status as well as moisture content can act as the basis for future evaluation as to the effectiveness of cultivation methods and track the changes to soil tilth and fertility. Once your knowledge of the soils found on your farm is broadened a good soil augur can be used to quickly evaluate which class of soil a particular block will fall into. The economic potential for each block and then the whole farm can then be determined. Other tools to take with you is a broad yellow tape to measure topsoil depth and other strata, a penknife or geological hammer to check for hardened layers and a clip board to record the analysis and details of each hole. The water use by crops from a soil profile is largely determined by the growing period of the crop, the millimetres (mm) of water used by transpiration through the plant from the soil and the evapotranspiration of rain water from the surface of the plant and soil. Maximum usage of moisture usually occurs at flowering and seed filling. For example maize might have a growing period from 125 to 180 days and could use any thing from 500 mm to 800 mm depending on climatic factors and cultivar chosen. Related values for sunflowers are 125 - 130 days and 600 mm to 1 000 mm. Some of the main objectives of evaluating the soil moisture would be to determine current status of moisture in the soil at any time in the growing season or between crops. An estimation of total crop requirements less the retained moisture at planting would give you an idea of the rainfall or irrigation required in the growing season to enable the crop to complete its normal growth cycle. Field capacity is the amount of water remaining or retained in the soil a few days after having being wetted and after free drainage of excess water has stopped. Field capacity in top soil is also defined as a condition of soil when there is a balance of 50% water and 50% air in a particular sample. The ‘feel and appearance method’ is a practical method of estimating soil moisture in the various layers, with differing soil textures, by squeezing the soil sample from each different strata in your hand to form an irregularly shaped ‘ball’. The sample is also squeezed in your hand between thumb and forefinger to form a ribbon. The soil texture, ability to form to ribbon, water glistening, loose soil particles, soil/water staining on the fingers can then be compared to charts, and by using experience, for the estimation of available water percentage for sandy loams, loams, or the lower under lying clays. The farmer must do a course on the identification of the differing soil types to be able to assess the different soils in the strata accurately. As a general rule a fine sandy loam will retain 25,4 mm per 150 mm of depth and a clay 25,4 mm per 76 mm of depth. Other soil types will retain moisture levels between these values. As a simple example the profile hole in Photo 1 shows a Westleigh soil, located in the Eastern Free State, with about 45 cm of fine sandy clay loam topsoil on soft plinthic clay. The land was planted to eragrostis curvula pasture grass over 15 years ago. There is evidence of high organic matter and humus build up with no hardpans or impediments to root growth. Evidence of strong root growth was found deep in the soft plinthic clay. The effective rooting depth is thus estimated at about 60 cm. This land had received 128 mm of rain during March, April and May of 2016. The soil moisture can be estimated as follows: 450 mm divided by 150 mm topsoil x 25,4 mm at 60% field capacity equals 45 mm of stored moisture in the topsoil layer. 300 mm of soft plinthic clay would hold about 60 mm of moisture giving us a total of a 105 mm or 4 inches of stored moisture. The land will be put back to crops starting with a no-till crop of soybeans. Weed control with a glyphosate base and other chemicals applied in two sprays will control any regrowth of grass. 30 mm of rainfall was received on 20 October 2016. Having assessed the soil moisture this farmer can plant with confidence that the crop will be able to go through until January without further rain and will have a very good likelihood of success given future normal rainfall patterns. Keep in mind that a very deep Hutton or Avalon soil in a rainfall area receiving a long term average of 850 mm will have a minimum of 6 t/ha maize production potential. The Westleigh shown in the photo, in a region with a 625 mm long term rainfall average would have an estimated maximum 3 t/ha maize production potential with a possible 4 ton maize potential in an exceptional year. As a farmer it is wise to know your soils and be able to assess soil moisture to be able to monitor effective cultivation methods so as to store as much soil moisture as possible to be able to reduce the financial risks of planting crops or managing pastures in the coming seasons. It is highly recommended that the publication Soil Classification – A taxonomic system for South Africa, 2nd Revised version, ISBN 0-621-10784-0, be obtained from The Research and Technology Manager, Private Bag X79, Pretoria, or ordered from reputable bookshops using the ISBN reference. This is the ‘bible’ of South African soil classification and should be in every farmer’s bookcase as a reference to accurately determine the class of soils on your farm and as an aid in determining the true agricultural potential of your farm.